Thanks for clearing that up for me Captain Groggy Swagger. I would have had to wait for Dylan to play it for me. Captain Groggy, I like to imagine that you got your axe and plucked away at those strings and figured it out from first principles. Is that what happened? Or something less romantic? 🙁 I thought it was the anniversary of your blog. I think I was a dumbass and wasn’t supposed to answer it. I am sorry. It reminded me of Perplex City. I magnified it and read the words, saw that it was written in tablature and searched for the lyrics + tabs. You did exactly what you were s’posed to do…except I would have preferred you to figure it out on a guitar rather than google it. BTW I was inspired by Perplex City to create my Happy Anniversary in the form of a puzzle. I had originally planned for Dylan to solve the puzzle and have him tell G, “Dad says ‘Wish you were here'” but then I panicked and worried that a) G wouldn’t recognize that it was a puzzle or that b) D would be too lazy to solve it. So I posted it on my blog where, I hoped, one of my puzzley-inclined or musically-inclined readers would post the answer for my wife to read. G didn’t recognize it as a puzzle – or even that it was a custom-made anniversary card – until she read your comment. Dylan figured it out from just reading the tab and made his father very proud. I don’t have a guitar on hand. Or rather I do, but they are all rather decorative and not in tune (At the Hard Rock hotel in Vegas). I did try to suss out the tune in my head as I do know how to read tabs, but I was not familiar with it. 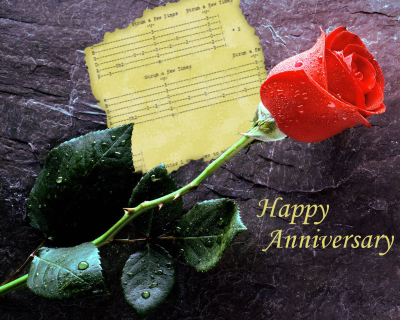 I do wish you a happy anniversary though and the future success of the garage band you and Dylan will be starting.